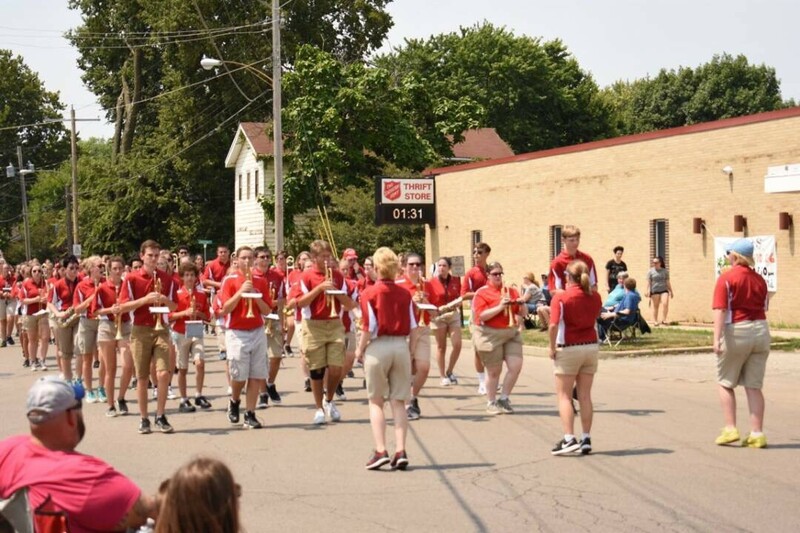 Even with a gas line break, the Ottawa Township High School Band met everyday to prepare for their 2018 marching season during the week of July 30. Director Andrew Jacobi and senior drum majors Mackenzie Olson and Alayna Stumpf and junior drum major Cori Lindig, led the group through five hour rehearsals that covered parade marching, as well as the music and drill for this year’s halftime show, which features selections form Sir Andrew Lloyd Webber’s award-winning musical “Jesus Christ Superstar.” In a matter of days, the band was able to set a forty-one page drill to music and run the rock-opera show from the top, a rather impressive feat for a group best known for its concert bands. “This year at band camp, everyone took difficult music and drill, made it into something great and had a fun and growing experience in the process,” Lindig said. While several hours spent on the practice field in ninety degree weather probably isn’t anyone’s ideal way to spend their summer, senior mellophone player Julia Gromm said “When it goes this smoothly and I know we’re getting things together so we’re prepared for our first game, it’s not so bad.” And that sentiment was certainly shared by most members of the band as they geared up for their first halftime performance that was less than two full weeks into the new school year. “It’s a lot of hard work, but it’s time spent bettering ourselves surrounded by friends,” senior trombone player Grace Lowe said. And even with all of that energy spent on their halftime show, the band was still ready to march for River Fest the Sunday after camp. The nearly two mile route gave the group the chance to show off the work put into marching practice and their music rehearsal with “Superstar”, a portion of their halftime show, and “Pep”, the school’s fight song, as they kicked off their 2018-2019 performance year.